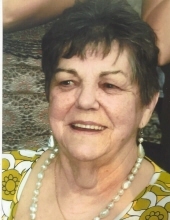 Devoted mother of Christine Livingston, Francine (Jim) Sourbis, Edward (Barbara) Nyquist, Mary Pesavento, Dean (Janet) Atkin, and Paula (Timothy) Nearey. Proud grandmother of Georgia, Jimmy, Oscar, Elizabeth, Ellen, Frank, Derek, Carl, Michelle, Christopher, Chuckie, Joanne, Dean, Phillip, Amanda, and Brandon. Adored great-grandmother of Niko, Demetri, Alec, Vivienne, Collette, Jimmy, Makenzie, Jaiden, Ava, Trevor, Tyler and Ricky. Loving sister of Nancy Stewart. Visitation Thursday 3-8 p.m. at the Robert J. Sheehy & Sons Funeral Home, 9000 W. 151st Street, Orland Park, IL. "Email Address" would like to share the life celebration of Joan M Chat-Atkin. Click on the "link" to go to share a favorite memory or leave a condolence message for the family.